We’re here!! I finished packing last night around 12:30 and then had a good bit of homework I needed to get done before we left. I finally got to bed around 2:30, but had to get up at 4:30 to leave for the airport. Dad’s flight left at 7:30, so we got there at 6:15 and quickly said goodbye to him. I ran into Pro on the way in and it just so happened our seats were already together. Naturally, that stroke of good luck meant it wouldn’t be necessary to work on our presentation for Monday like we’d planned. The flight was smooth and came complete with a flavorless omelet and really good coffee. I realized as we touched down that I’d forgotten to fill in the customs form and then once we got to baggage claim Pro and I noticed that we’d left our baggage claim checks on the plane. The security guard let us through after checking our passports and I got lucky at customs and didn’t need to be searched. We took a bus to the school and stored our luggage for the afternoon while we took the Turibus (tour bus) around the city for a few hours. 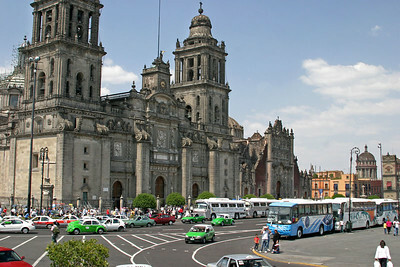 Tomorrow we’ll visit the Templo Mayor and Zocalo (big square/market). My family is really nice. Karolina met us at the airport as it turns out she was in charge of organizing a lot of our trips through the local university. I met Ignacio later in the evening and he took me back to the apartment and gave me a tour while Karolina finished helping the other students meet up with their families. Afterwards we made dinner- tortillas, cheese, ham, and avocado quesadilla style. I’m really glad to have internet here so I can keep in touch with everyone back home. I’m having a great time so far and although the Spanish was a little slow to kick in it’s starting to come back to me.